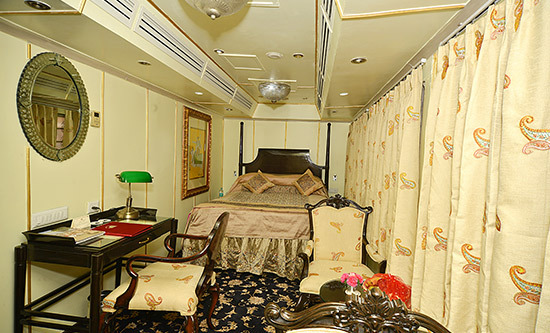 Palace on Wheels train has two types of cabins such as Deluxe Cabin and Super Deluxe Cabin. 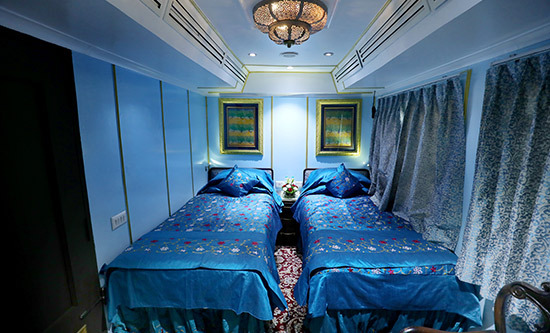 Each cabin of Palace on Wheels is decorated in its themed stone color. Name of the coaches are taken from the princely state of Rajasthan. The luxury cabins are furnished with amazing decor and also provides a luxurious comfort onboard the train. Rich silk fabrics, beautiful artworks and antique wooden furniture work add to the opulence of the Palace on Wheels train. The train is assured with world-class services where you can enjoy the facilities of attached bathroom with posh toiletries, bedroom, individual temperature control, internet connectivity, electronic safety deposit, hair dryer and telephone, etc. Each cabin have the availability of a special attendant called Khidmatgar to cater to your needs onboard the train.